Known as “The World’s Oldest Musician”, trombonist Scott Shelsta has entertained people from all walks of life. 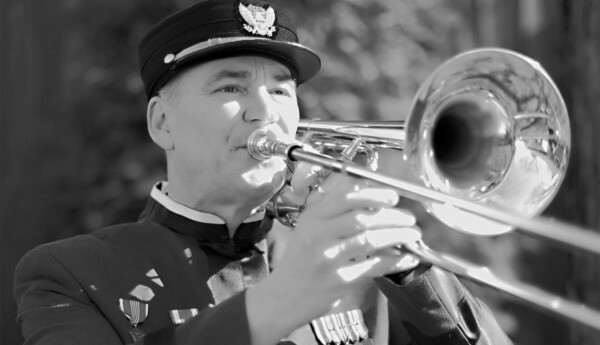 As the trombone soloist for “Pershing’s Own” The United States Army Band, Scott has performed for all US Presidents from former President Richard Nixon to President George W. Bush, as well as several Foreign Heads of State and Dignitaries. One highlight of his Military Career was playing for the Interment of the Vietnam Unknown Soldier. Born and raised in Hayti, SD Scott participated in various Local, County, State, and Regional competitions as a young trombonist. His performance career took flight when he was in fifth grade and started playing solos for various American Legion and Patriotic occasions. Upon graduation from High School Scott attended Augustana College in Sioux Falls, SD where he studied with the late Tom Ellwein, a fine player and teacher who had been a member of the US Marine Band, Washington DC. Following graduation from Augustana College, Scott taught public school instrumental music in Luverne, MN and toured with the famed Glenn Miller Orchestra. Eventually Scott found himself continuing his performance education by attending the University of Northern Colorado in Greeley, CO where he studied with the acclaimed Master Teacher Edwin “Buddy” Baker. In 1974 he received his Masters Degree in Brasswind Performance and Pedagogy. He then enlisted in the US Army and was assigned to the United States Army Band Pershing s Own, where he replaced the late trombone soloist, SGM David Maser. Scott’s forte as a trombone Solo artist features the Turn of the Century style playing. These solos are extremely demanding and seldom heard in public. The artist must obtain a careful balance between strength and flexibility which is the age old problem of brass players everywhere. Arthur Pryor’s Blue Bells of Scotland and Air Varie are considered trombone technical showpieces. Pryor was a noted soloist for the Sousa Band prior to becoming leader and soloist of his own highly successful concert band. Scott holds memberships with several different organizations including the International Trombone Association, the Ringgold Band of Reading Pennsylvania (Lifetime), the Hagerstown Municipal Band of Hagerstown Maryland (Honorary), the Brass Ensemble of the Basilica of the National Shrine of the Immaculate Conception, a member and featured soloist with the Virginia Grand Military Band, the Classical Brass, the Interservice Trombone Choir of Washington DC, the Washington Brass, the Washington Federation of Musicians, and had been principle trombone in the Washington Chamber Symphony with it’s twenty-five regular annual concerts at the Kennedy Center for Performing Arts. He also spent 30 years as a member of the internationally acclaimed United States Army Band Brass Quintet. This Group had no personnel changes during their first 24 years of existence. On May 31, 2004 Scott retired as a Sergeant Major from the US Army Band, “Pershing’s Own” Washington DC. More recently Scott has found himself on tours to Australia, Canada, the Caribbean, Japan, The Netherlands, Norway, and Sweden. He continually plays solo concerts throughout the world, wearing his signature 1890’s American uniforms, portraying “The World’s Oldest Musician”. Who by chance, happened to be playing trombone with the historical American bands of Gilmore, Liberati, Pryor, and Sousa. Scott plays Edwards Trombones exclusively and is experienced in all popular and classical venues.